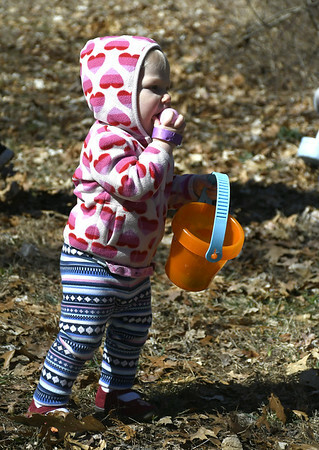 BERLIN - Following the trail marked by Easter eggs, paw prints, flowers, and butterfly signs, children carrying colorful baskets found their way to the Easter Eggstravaganza at Hungerford Park Saturday morning. 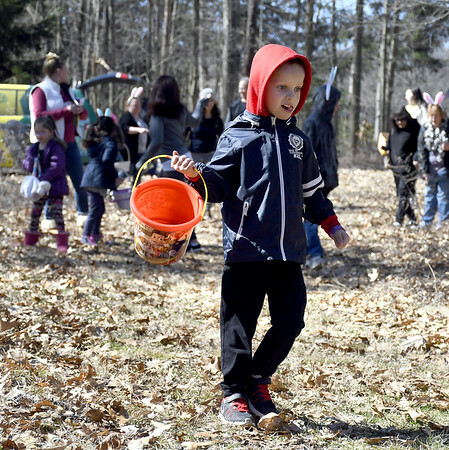 The hunt was well organized, with just 10 to 20 children allowed into the hidden egg zone at a time. The others were inside the museum, doing crafts, visiting with the resident animals or checking out the bake sale, until it was their turn. Every participant was allowed to collect 10 eggs, each with candy, a sticker, a small toy or a raffle ticket inside. The raffle tickets were good for prizes too big to fit inside a plastic egg. Everyone got a goody bag, too. The weather was perfect for late March. “We’ve actually lucked out. Every year it’s been nice weather. One year we got a little bit of snow but just a little,” Gagnon said. Elizabeth Weeks, a third-grade teacher at Vance Elementary School in New Britain, was there with her husband, William, and their children, 2 1/2-year old Elliot and 1-year-old Samantha. On her very first hunt Samantha had managed to put a few eggs in her basket but was then taking them out and putting them back on the ground. Elliot was wearing sunglasses and a determined look as he collected his eggs. The Weeks family looked at the snakes in the museum before coming outside for the hunt and were planning on going back afterward to meet Speckles, the museum’s black and white, floppy-eared rabbit. They came all the way from their home in Avon. “It’s a drive, but we came because it’s so much fun,” Weeks said. Posted in New Britain Herald, Berlin, New Britain on Sunday, 1 April 2018 21:28. Updated: Sunday, 1 April 2018 21:30.